While a merger uniting Men’s Wearhouse, Jos. A. Bank, and handful of other companies under the parent company Tailored Brands was technically completed in 2015, the work was just beginning for vice president and assistant general counsel Neyha Rajan. The high-profile deal meant new brands, new people, and a virtually endless stream of new challenges for her and her legal department. Though Rajan jokes that her job title should probably include “And Everything Else That Comes Up,” she has devoted considerable time post-merger to putting a face to a department that is often seen as cold and closed off. “I try to empower my business partners so that lawyers aren’t these mystical creatures,” she says with a laugh. Rajan says her focus on humanizing her department is rooted in the desire for better communication company-wide in the post-merger climate. “Oftentimes I’ll be in a meeting or see an email or hear through the grapevine something like, ‘Legal-With-A-Capital-L said we can’t do that,’” she says. This kind of interaction can be isolating for all parties involved, and Rajan believes that establishing more direct and compassionate interaction serves the entire team better. “Legal is made up of real people who are your colleagues and friends looking out for the company,” she says. Rajan sees early intervention not just as a strategy but as a means of forming more collaborative relationships—relationships where the payoff is more than just a one-time conversation. “If we have positive interactions in advance, then my colleagues will be more likely to reach out when there is a problem or the next time they’re working on something,” Rajan says. It can result in more work in the short term, but it often means avoiding far more negative and time-draining encounters down the line. Tailored Brands’ acquisition of Jos A. Bank, Joseph Abboud, Men’s Wearhouse, and several other brands has presented different challenges in terms of remaining compliant while staying on-brand. Following the merger, Rajan says, it became evident very quickly that maintaining a unique voice for each company was essential, and it has required the legal department to be flexible while helping align each brand’s goals and compliance. Rajan has been in a state of what she affectionately calls “firefighting” for the past few years. Tailored Brands now comprises 20,000 employees—a rapid expansion that has given Rajan barely a moment to breathe. “It has taken us this much time to really absorb and integrate and take advantage of Jos A. Bank and all the different brands,” she says. It’s only recently that she has been able to shift from fighting fires to reflecting on the merger process and having time to start planning more proactively. “Now the real work begins in a more thoughtful and team-oriented way,” she says. When it comes to the likelihood of a data breach and what Rajan takes away from many of the data-security seminars she attends, she returns to the fire analogy. “When someone tells you you’re gonna have a fire, it sounds scary; it also sounds very unhelpful,” Rajan says. “You tell me there’s going to be a fire but not how to prevent it or stem the damage. That’s what I’m trying to figure out.” Rajan says it’s essential to be in regular communication with IT and other business partners to identify and address risk concerns. The social media presence and interaction of Tailored Brands’ 20,000 employees, hundreds of store locations, and countless customers is also an area of focus for Rajan and her team. Creating and maintaining communication standards for a constantly evolving medium not only requires a great deal of her time but also a significant workforce. Multidisciplinary teams including people from employee relations, legal, store operations, customer relations, and marketing for social and digital platforms are all potential collaborators, and Rajan has to figure out who needs to be at the table. “The more people you have, the harder and more complex it gets but the better the reward in the end,” she says. Rajan’s aptitude for collaboration has also led to her chairing the diversity and inclusion (D&I) group at Tailored Brands. She says the company’s commitment to D&I means the entire business will have access to bigger and better ideas. “I can use all of the education and experience that I’ve had and actually get to use it to help promote ideas, promote awareness, and give voice to others,” Rajan says. 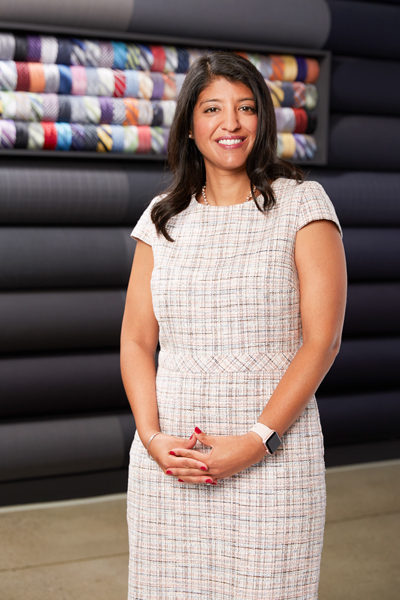 As Tailored Brands continues to focus on brand integration, Rajan says she’ll continue to provide advice for non-lawyers at the company. She is able to interact with the law, but the conversations with non-lawyers take place on a much more human level. “It’s my favorite part,” Rajan says.